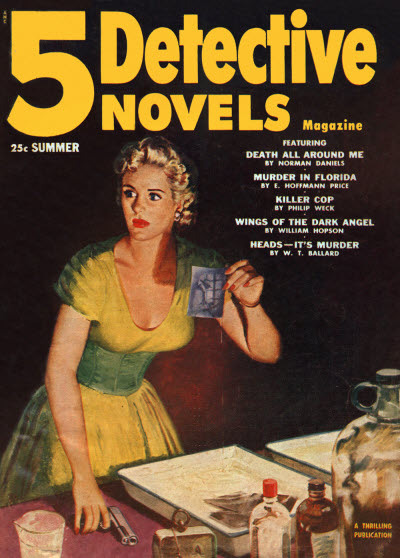 One story was announced for the unpublished Winter 1954 issue. 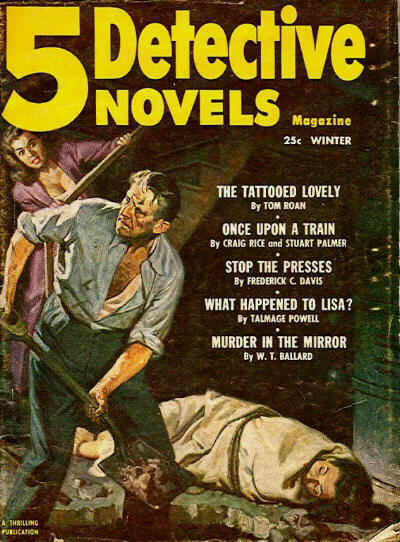 Canadian reprint edition of 5 Detective Novels Magazine. Number of issues published not known. Lynn Lauber, Copy Editor; Carole Abel, Editorial Consultant. Details supplied by Todd Mason. 6 · Past Forgetting · Pamela Lind · n. Silhouette 1982; edited and condensed. 35 · My Lady Domino · Sandra Heath · n. New American Library 1983; edited and condensed. 64 · Midnight Lover · Juliet Ashby · n. Simon & Schuster 1983; edited and condensed. 90 · Fools Gold · April Harbringer · n. 1979; edited and condensed. 117 · Loves Journey Home · Bree Thomas · n. New American Library 1983; edited and condensed. 3 · For Love or Money · Dana Daniels · n. Berkley 1984; edited and condensed. 32 · Beautiful Dreamer · Cynthia Blair · n. Ballantine 1983; edited and condensed. 61 · Forgiveness · Jennifer Allyn · n. Ballantine 1983; edited and condensed. 88 · Hot Springs · Shirley Parenteau · n. Ballantine 1983; edited and condensed. 114 · At Long Last Love · Carole Buck · n. Berkley 1985; edited and condensed. The table of contents lists this as Volume 2 No. 6, November/December 1985. 3 · This Side of Paradise · Cinda Richards · n. Berkley 1984; edited and condensed. 31 · Fascination · Candice Adams · n. Ballantine 1982; edited and condensed. 59 · Seaflame · Sarah Crewe · n. Berkley 1984; edited and condensed. 89 · Stars in Her Eyes · Judith Yates · n. Berkley 1983; edited and condensed. 116 · Music of Love · Marcia Rose · n. Ballantine 1980; edited and condensed. 3 · Country Music · Nancy Bacon · n. Ballantine 1982; edited and condensed. 31 · Gentleman at Heart · Elissa Curry · n. Berkley 1985; edited and condensed. 59 · Passions Dance · Lauren Fox · n. Berkley 1985; edited and condensed. 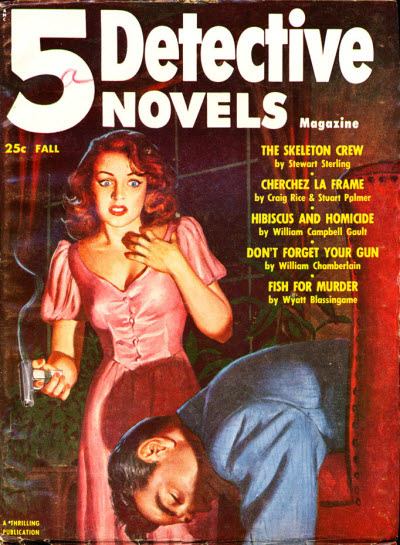 88 · The Steele Trap · Betsy Osborne · n. Berkley 1985; edited and condensed. 116 · Venetian Sunrise · Kate Nevins · n. Berkley 1984; edited and condensed. 3 · Master Touch · Jasmine Craig · n. Berkley 1985; edited and condensed. 32 · Brians Captive · Alexis Hill Jordan · n. Dell 1983; edited and condensed. 62 · Fallen Angel · Carole Buck · n. Berkley 1985; edited and condensed. 91 · Desire and Conquer · Diane Dunaway · n. Dell 1983; edited and condensed. 118 · Thief of Hearts · Jan Mathews · n. Berkley 1985; edited and condensed. 3 · Dark Lightning · Karen Keast · n. Berkley 1986; edited and condensed. 31 · Spring Madness · Aimee Duvall · n. Berkley 1985; edited and condensed. 60 · Enduring Love · Tate McKenna · n. Dell 1983; edited and condensed. 89 · Cant Say No · Jeanne Grant · n. Berkley 1985; edited and condensed. 117 · Suddenly That Summer · Jennifer Rose · n. Berkley 1985; edited and condensed. 2 · Irrestible Forces · Marie Michael · n. Bantam 1984; edited and condensed. 32 · Anywhere and Always · Lee Williams · n. Berkley 1986; edited and condensed. 60 · Autumn Flames · Sara Orwig · n. Bantam 1983; edited and condensed. 117 · Ever Since Eve · Kasey Adams · n. Berkley 1986; edited and condensed. 2 · Windflame · Sarah Crewe · n. Berkley 1983; edited and condensed. 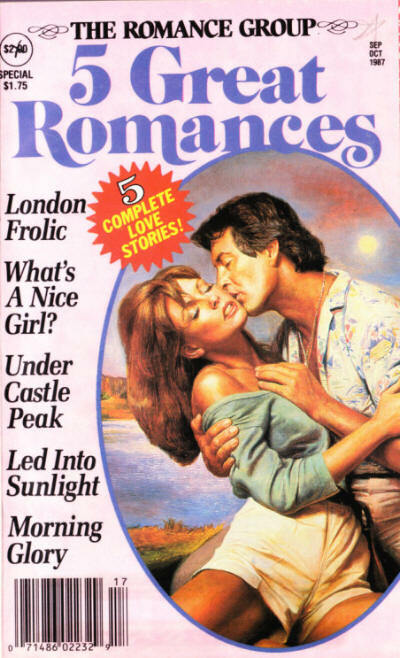 61 · Love with a Proper Stranger · Christa Merlin · n. Berkley 1985; edited and condensed. 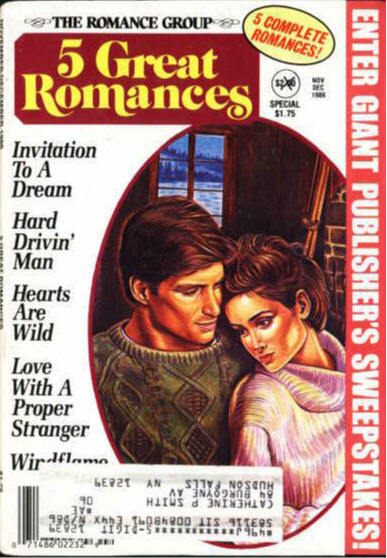 91 · Hard Drivin Man · Nancy Carlson · n. Bantam 1983; edited and condensed. 118 · Hearts Are Wild · Janet Gray · n. Berkley 1985; edited and condensed. 32 · Little Consequences · Barbara Boswell · n. Bantam Loveswept 1984; edited and condensed. 61 · Blue Skies, Golden Dreams · Kelly Adams · n. Berkley 1984; edited and condensed. 89 · A Kiss Away · Sheryl Ann Woods · n. Berkley 1986; edited and condensed. 118 · Happily Ever After · Carol Buck · n. Berkley 1986; edited and condensed. 2 · Bringing up Baby · Diana Morgan · n. Berkley 1986; edited and condensed. 35 · Tailor-Made · Elizabeth Barrette · n. Bantam Loveswept 1985; edited and condensed. 65 · My Wild Irish Rogue · Helen Carter · n. Berkley 1986; edited and condensed. 93 · Kid at Heart · Aimee Duvall · n. Berkley 1986; edited and condensed. 121 · Dillons Promise · Cinda Richards · n. Berkley 1986; edited and condensed. 34 · Long Road Home · Jean Faure · n. Berkley 1986; edited and condensed. 61 · Hanky-Panky · Jan Mathews · n. Berkley 1986; edited and condensed. 89 · Sun-Kissed Hearts · Kit Windham · n. Berkley 1986; edited and condensed. 119 · Sweet Temptations · Diana Mars · n. Berkley 1986; edited and condensed. 4 · Whats a Nice Girl? · Adrienne Staff & Sally Goldenbaum · n. Bantam Loveswept 1985; edited and condensed. 35 · Led Into Sunlight · Claire Evans · n. Berkley 1982; edited and condensed. 89 · Morning Glory · Kasey Adams · n. Berkley 1986; edited and condensed. 119 · London Frolic · Josephine Janes · n. Berkley 1983; edited and condensed. 2 · Prince Charming Replies · Sherryl Woods · n. Berkley 1988; edited and condensed. 27 · Dreams of Joe · Billie Green · n. Bantam Loveswept 1985; edited and condensed. 78 · No More Mr. Nice Guy · Jeanne Grant · n. Jove/HBJ Books 1986; edited and condensed. 104 · Carolina Moon · Joan Darling · n. Berkley 1987; edited and condensed. 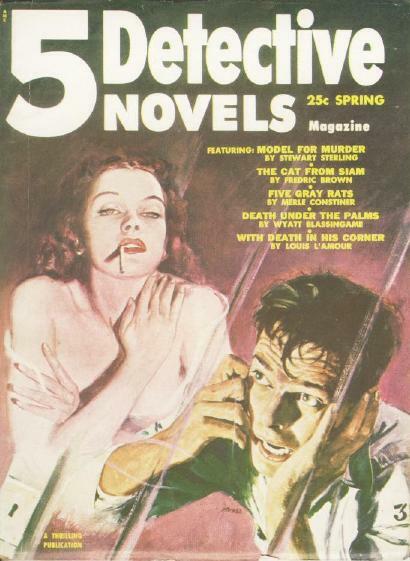 Given as v 3 #34 on cover and spine. Details supplied by Denny Lien. 62 · Surrender the Dawn · Jan Matthews · n. Berkley 1988; edited and condensed. 89 · A Warm December · Jacqueline Topaz · n. Berkley 1988; edited and condensed. 116 · Smiles of a Summer Night · Delaney Devers · n. Berkley 1986; edited and condensed. Bound remainders of issues of Schoolboys Pocket Library, published by Gerald G. Swan in the 1950s. Bound remainders of issues of Schoolgirls Pocket Library, published by Gerald G. Swan in the 1950s.